Plants are supplied already established in 2 litre pots. Finally here is a black raspberry that's really worth a place in your garden and the fruits are just incredible! 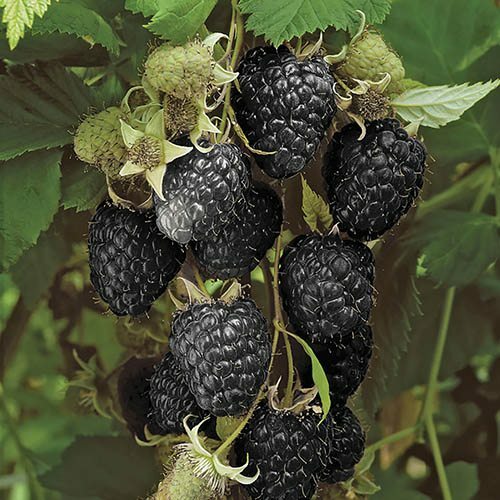 You'll get a midsummer crop of ebony coloured fruits with an intense flavour that is much more aromatic than regular raspberries and tests have shown that they are particularly high in health giving antioxidants. They are delicious eaten fresh and make a wonderful addition to juices and smoothies. Originally from the US, Black Jewel is tough and hardy so ideally suited to British conditions and very easy to grow. It's genetically different to normal raspberries and has excellent disease resistance, the habit is just like a summer fruiting type with berries borne on year old growth. Old canes should be pruned away after fruiting (in late summer). Grow with supports against a sunny wall or fence or alteranively in a large pot.